What do you do to motivate yourself when you don’t feel like writing? I can’t believe I almost forgot. This Thursday, October 26 is the next PBPitch Twitter event. I’ve participated a couple of times. It’s neat. You pitch your idea on Twitter using the #PBPitch hashtag. If an agent or editor favorites your pitch, you check their website for submission guidelines (follow them to the letter) and then submit your manuscript to them. *Pitch your PBs on twitter using #PBPitch. *If you are an author/illustrator, you can attach an image to your PB manuscript pitch. *Include Subgenre # if it applies. *Only agents and editors should FAVORITE a pitch. *If they do, check their submission guidelines (and do your research) before submitting to them. I am participating again this year because I have a handful of picture books that still don’t have a home yet. Anyone else here participating? Good luck to all! It’s time for a goals update. 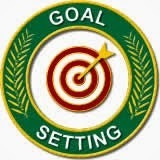 I used to review my goals once a quarter, but now it’s more like twice a year. No matter how often it happens it is important to gauge progress. Goal 1: Complete! Picture Book Idea Month became STORYSTORM this year. This allowed more writers to participate and certainly helped me to achieve my goal of 30 story ideas in 30 days. Goal 2: I’m really not a short story person, but I am hoping something I have in my finished works might be tweaked. Might look at this on vacation next month. Goal 3: Not yet. I may be too late, but I’ll see what the themes are for the remainder of the year and go from there. Goal 4: Definitely got back into guest blogging this year. The release of Macaroni and Cheese for Thanksgiving and my participation in the Author’s Fair at our local library helped this along. Goal 5: Did not happen and might not happen. I ended up going in a slightly different direction, using my monthly writing group meetings to review The Sisterhood, a women’s fiction story that I would really like to revise. Goal 6: I’ve only missed one so far this year. I’ll miss next month’s while we are on vacation. Amazing considering how busy my real estate business has been. New item: Amos Faces His Bully is currently being illustrated. That should come out sometime later this year. I’ll need to dedicate time October – December to promote it. New item: I’ve given the Christian chapter book I ghostwrote to one of my publishers for review. With any luck I’ll be needing to work on edits to that this year as well. Say a prayer. How are your writing goals coming? Hard to believe it’s that time of year again. Before I get into the goals I am setting for 2016, I would like to review what I’ve accomplished in 2015. Because this was going to be my first full year of working outside the home, I kept my goals simple and few: daily Bible reading, complete editing projects, complete Amelia’s Mission by May 31st, and reconsider my blogging duties. So, how did I make out? This has gone from being a chapter a day to a verse a day, but at least I am still reading. In addition, I’m working books like The Purpose of Christmas by Rick Warren into my reading schedule. I had two large editing projects this year. Both of them worked out well and I was glad to see they both made it to the publishers on time. Complete Amelia’s Mission by May 31st. As I mentioned in July when I last updated my goals, this seemed realistic when I set it in January. Then my real estate business took off and writing was pushed aside. I ended 2015 with fourteen closings and five rentals. I currently have three listings and numerous potential sales coming up. So, where does that leave poor Amelia? With thirteen chapters completed, I haven’t touched the manuscript since July. Not that I haven’t been doing some writing, it’s just on other projects and not as much as I would like. I have, however, regularly attended our critique group meetings, so that means I always need to have something to bring with me. I need to remain realistic in setting my goals for 2016. I’m thinking the amount of time dedicated to writing will be the same or less than it was this year. In addition, I want to make sure to keep some balance between my personal and professional lives. Kids are only little so long. My girls are already in middle school and high school. Complete Amelia’s Mission by December 31, 2016. Hard to believe I am giving myself a whole year for this, but spring will be very busy and summer is dedicated to the kids. I love this story and won’t give up on it. Most of my research is done, so writing should go smoothly when I have the time to dedicate to it. Continue to attend critique group twice a month. We meet at the library the first Monday of the month and at my office the third Monday, so at least I am sure to get one in on a monthly basis. At these meetings I am getting feedback on: A Shepherd’s Journey (Christian fiction), Montezuma’s Revenge (romantic suspense novella), and Searching for Popularity (tween/teen fiction). This was the first full-length novel I finished. It’s women’s fiction, and I feel it has a lot of promise. It just needs a ton of editing. I doubt I would get all the way through it, but even if I got through a quarter of it, that would be progress. What is not under my control? My publisher has two of my picture books under contract. They’ve had them for a while, but are awaiting available illustrators to work on them. My hope is Macaroni and Cheese for Thanksgiving will be out next fall, but we’ll have to see. I don’t think Amos Faces His Bully will be out until 2017 or later. That’s it for me. Have you set your writing goals for 2016 yet? Feel free to share them.